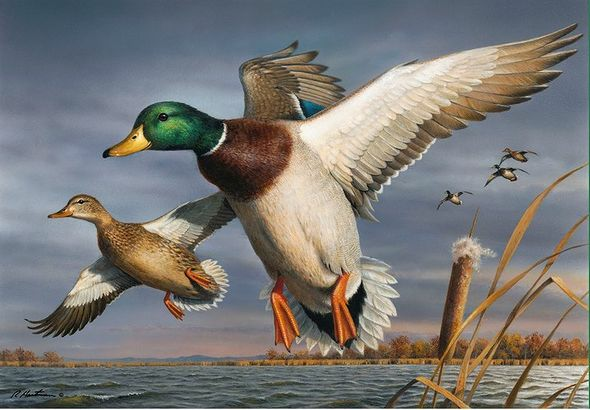 Federal Duck Stamp Print COLLECTOR'S EDITION 2018-19 Limited Edition by Robert Hautman:"Mallards"
Title: Federal Duck Stamp Print 2018-19 "Mallards"
Bonus: Free Brass Name-Plate and Non-Glare Glass on Framed Prints. Just include your request in the comment box at checkout. Image Dimensions: 9"w x 6 1/2"h. / Print size, 12" x 14". About the Art: The 2018-2019 Federal Duck Stamp features a pair of mallards landing in a marsh painted by Robert "Bob" Hautman. This is Hautman's third Federal Duck Stamp. Bob Hautman was also named as Ducks Unlimited Flyway Artist of the Year for 2018.